Vladimir Simovic and Darko Vesic (VS and DV): Norway is considered as one of the most successful (economically, socially, etc.) countries in Europe and beyond. As such Norway is usually taken as a model for other countries to look up to. But the real question would be is Norway an exception in this age of neoliberal capitalism and the crisis it generated? Asbjørn Wahl (AW): Norway is currently in a better position than most other countries in the world. There are two important reasons for that. Firstly, Norway is well-endowed by nature. Particularly, we are for the time being a wealthy oil-producing country (but also rich in fish resources and hydro-electric energy). This gives the government a huge annual surplus which most countries can envy us. The oil and oil-related industries also create jobs at a rate which keeps unemployment among the lowest in the world, at about or under 3 per cent. This low unemployment rate means that the trade unions are still relatively strong at the bargaining table. Secondly, Norway was already among the most developed welfare states when oil was first found (in the 1960s). The balance of power in society was in other words of a sort which made it possible to socialize most of the oil revenue, different from the situation in many other oil-producing countries where big oil companies and/or local elites are able to expropriate most of the extraordinary high economic rent and profit from this industry. There has therefore neither been necessary, nor politically possible, to implement the same sort of harsh austerity policies in Norway as we can see in most of the rest of Europe. The relatively big public sector then, contrary to mainstream neoliberal theory, also contributed to stabilizing the economy and reducing the negative effects of the financial crisis from 2008, and extra oil revenue was put into the public economy in 2008-2009 to further dampen the effects of the crisis. On the other hand, also in Norway we have seen more or less soft neoliberal policies pursued by governments – both right and so-called left – over the last 30 years. Liberalization, deregulation and privatization have taken place. The pension system has been reformed and thus weakened (reduced pensions for most people, less redistribution from the top to the bottom, more individual risk etc.). So-called New Public Management methods have been introduced in the public sector, so that for example the hospital sector has been more market-oriented; inequality and child poverty has increased, and so on. All this has taken place in a more modest way than in the rest of Europe, but the direction is the same. My view is that the currently favourable situation in Norway is rather fragile. The country is deeply integrated in the European and World economy and thus strongly influenced by the neoliberal offensive. A further set-back in the world economy can hurt Norway’s export heavily. If so, unemployment will increase rapidly and the trade union movement can thus be weakened considerably, a trade union movement which is still deeply embedded in the social partnership ideology, and thus less able to mobilize for more confrontational struggles if and when that becomes a necessity. I often frame the Norwegian situation in this way: Yes, it is true that the Norwegian welfare model for the time being stays on the upper deck of the global ship. But it may be the upper deck of Titanic. VS and DV: Similarly to this specific position of Norway today, we can say that specific historical conditions enabled the rise of welfare state after Second World War. Can you tell us something about the emergence of the welfare state? AW: The history of the welfare state is very much linked to the class compromise between labour and capital which developed in most of Western Europe in the 1930s or immediately after World War II. [Ed. : see “Rise and Fall of the Welfare State”] Thus the rise of the welfare state also in Norway was strongly influenced by global power relations (including the Russian revolution and the following existence of another, competing economic system in Central and Eastern Europe – including the need for capitalists in the West to gather support from its own working-class in the Cold War against the Soviet Union). Simultaneously, there were also many national peculiarities which gave the welfare states different forms and contents in the various countries – and also different levels of developments. Even if there were many similarities in the Scandinavian countries (Denmark, Sweden and Norway), there were therefore also differences here. Norway has historically never had a strong upper class, neither during feudalism nor under capitalism. In a small and sparsely populated country small peasants have formed an important, independent and self-confident group. In the 1930s, we had a very strong growth and strengthening of the trade union and labour movement – based on a class alliance of workers, small peasants and locally based fishermen who owned their own boats. One of the effects of this development was that fascism never became strong in Norway. Another effect was that the main employers’ association decided to strike a deal with the trade union movement (in 1935) – the then formalization of a mature class compromise. 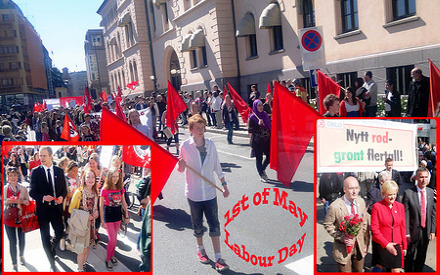 At about the same time, the Labour Party won sufficient support to form its first government in Norway. It was on the basis of this compromise and these power relations that the welfare state was developed in Norway. Thus, global and national circumstances played together to form the preconditions of the welfare state. At the global level it was the threat of socialism which made capitalists in Western Europe go for a class compromise (as a lesser evil in their view). We should also have in mind that the welfare state was never the demand of the working-class before it was established (not even the notion ‘welfare state’ existed). What the working-class fought for was socialism. As we know, this was not achieved. The welfare state then became the result of the historically very specific development which rather led to the historic compromise between labour and capital. Thus the welfare state itself is a compromise of interests. That is also the reason why the welfare state is so many-facetted and full of contradictions. While it represented enormous social progress for most ordinary people, it is maybe time now also to remind a rather modest labour movement that the welfare state does not represent, and has never represented the emancipation of the working-class. VS and DV: In the given circumstances of contemporary class dynamics is it realistic to expect the return of welfare system which was dominant in the third quarter of the 20th century? AW: My view is that the era of the welfare state is over, or at least it is coming to an end now. What we see particularly in the most crisis-ridden countries of Europe, is the systematic destruction of the welfare state. The rise of the welfare state was, as mentioned above, the result of a historically very specific development which can hardly be copied in any way. The welfare state then became possible due to comprehensive regulations and restrictions which were imposed upon capital (capital control, regulation of financial markets, bank regulation, a rapid expansion of public ownership in many countries and – not to forget – democratic reforms which gave ordinary people more influence in politics). The changes of power relations in society which we have experienced since the neoliberal offensive started around 1980 have abolished most of these regulations, so the power structure on which the welfare state was based, has already disappeared. What we experience now is more or less the harvesting period of capitalist and right wing political forces, in which they exploit the new balance of power to get rid of the best parts of the welfare state (not all of it – it was the result of a compromise, so it does also reflect capitalist interests here and there). To fight for a re-establishment of the welfare state in the current situation is therefore relatively meaningless. Of course we have to defend what we achieved through the welfare state, but our more long-term task is to re-establish our vision of another society, a society which is directed toward meeting peoples’ needs – and the strategies to get there. 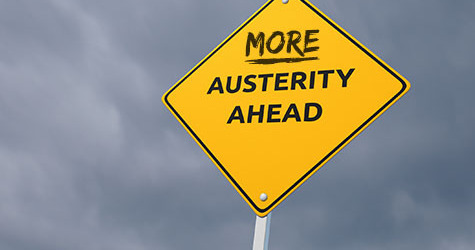 VS and DV: For the time being it is certain that the system is moving in the different direction – austerity measures, imposed under the pretext of crisis, eliminate the last trace of welfare state. 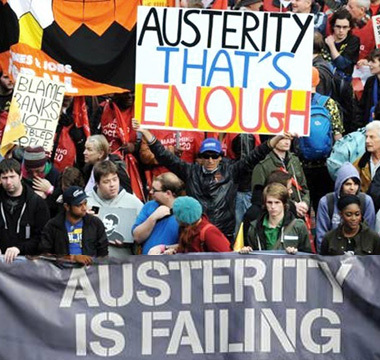 Is the crisis used as an excuse to concentrate the power in the hands of the dominant class? AW: Yes, it certainly is. I see that many politicians and trade unionists, also on the left, today say that the austerity policy of the Troika (the EU Commission, the European Central Bank and the International Monetary Fund) as well as of most governments in Europe is mistaken, because it will not contribute to regaining economic growth and creating jobs. They therefore try to convince the Troika and EU politicians to change policy. I think that is a grave misinterpretation of the situation. The short term aim of the Troika is not economic growth and jobs, it is actually to abolish the welfare state and defeat the trade union movement. At least, that is what is going on. VS and DV: Dominant interpretation of the post-socialist reality in Serbia is that we are still on our way to the “genuine capitalism” and that EU integration is going to resolve most of the economic and social problems of our society. From your point of view what does the EU represent today? AW: This sounds like a political fairy tale to me. What is “genuine capitalism”? Is it the post World War II welfare capitalism (which is now history), or is it the much more harsh, brutal and crisis-ridden capitalism we see unfolding around us today (and which Samir Amin has named “generalized monopoly capitalism”)? To believe that EU integration will create a prosperous future for Serbia, given what is now going on in Greece, Ireland, Portugal, Spain, the Baltic countries, Hungary, Bulgaria etc., really requires a big portion of unfounded optimism. Even if the EU was established already in 1958 (the EEC), and with more positive aims, the EU of today has got most of its form (pacts and institutions) and contents during the neoliberal era, something which is strongly reflected in its power structure, its policies and legislation. It therefore aggressively acts in the interest of capital. Neoliberalism and austerity policies are more or less constitutionalized in the EU today, and Keynesianism (or traditional social democratic policies) is banned by law (interestingly enough supported by all the social democratic parties in the EU). The fact that the EU already from the outset had a deep democratic deficit, has given it an important advantage in this regard. Furthermore, over the last couple of years the EU has moved rapidly toward a more and more authoritarian supranational state body in the interest of primarily financial capital – a development which is extremely dangerous seen in the light of recent history in Europe. VS and DV: We witness mass mobilizations and protests all around EU. Trade unions have major role in these events. Can you tell us how much have trade unions and their strength and position in society changed in last half a century? How much austerity measures, imposed by the troika, further paralyze trade unions and leave workers without their basic weapon for protection of their rights? AW: The trade union movement is under enormous attacks in Europe today. The European Court of Justice has limited the right to strike. Collective agreements in the public sector have been set aside by governments in at least ten EU member countries, while wages have been cut, all without negotiations with trade unions. Legislation is being introduced at national level in a number of countries in order to limit the right to strike and to be able to use more extreme measures to curb strikes by police forces and so on. In addition to this, capitalist forces are given ever more power in society, and regulations are introduced at the EU level, something which makes it easier to exploit the enormous wage gap between Eastern and Western Europe for social dumping in the west. This has provoked increasing mobilization and struggles from trade unions and social movements in many countries. However, the trade union movement in Europe has been strongly weakened during the neoliberal era and fights from a very defensive position. High unemployment and enormous loss of union members represent an important part of the picture. 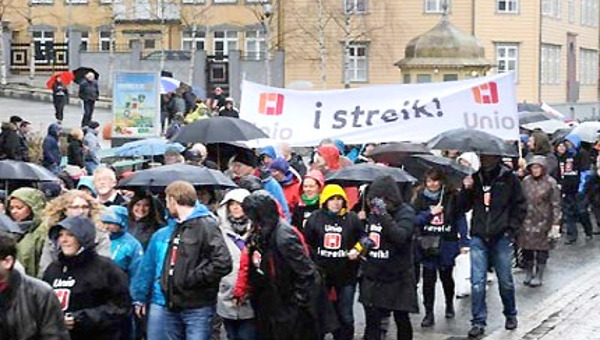 So far there has therefore not been possible to develop a coordinated cross-European resistance, even if the 14 November actions last year represented an important step in the right direction – when trade unions in six EU countries (Portugal, Spain, Italy, Greece, Cyprus and Malta) carried out a joint general strike while unions in many other countries mobilized for demonstrations. Both at the European and national level, most trade union confederations are strongly influenced by the social partnership ideology, putting a meaningless high priority on so-called social dialogue in a situation in which employers mainly have withdrawn from the class compromise and gone on the offensive to attack – day and night – what they previously accepted in the name of the social pact. In the current situation, this represents a dead end for the trade union movement. The European Trade Union Confederation (ETUC) has even launched a new ‘Social Compact,’ that is a new class compromise, as its main aim for campaigning. It seems as if they aim to convince employers and politicians that a new class compromise (of the post World War II sort) will be “in everybody’s interests.” Given the enormous struggles and the shift in the balance of power which took place prior to the previous compromise, this sounds pretty uninformed, to put it mildly. VS and DV: What would be your suggestions for further organizing? Is it possible to bend the stick, which is now significantly on the side of capital, back to balance? But in the end should we be satisfied with the balance or continue to push things forward? AW: I should have liked to say that I have the answer, but there is no quick fix. We are very much on the defensive today, and it will take time to organize, to mobilize and to build the social strength necessary to be able to meet the confrontational attacks from capital and states – and thus to turn the tide. There is a lot of organizational work to do among workers, including the growing groups of precarious and informal workers, unemployed, youth and so on. Then we have to build strong social alliances, firstly in the trade union movement itself – and then with other social movements (the on-going Alter Summit process is an interesting project in this regard at the European level). Based on what I have already mentioned, the trade union movement will also have to break with its social partnership ideology, which in reality today represents an un-workable reminiscent of a class compromise which is already history. This will require quite a lot of internal discussions in the trade union movement. The interview was conducted by Vladimir Simovic and Darko Vesic from Centre of the Politics of Emancipation (CPE), Serbia, and translated by the Transform Network. Asbjørn Wahl is the director of the Campaign for the Welfare State, an adviser for the Norwegian Union of Municipal and General Employees, and the Vice President of the Road Transport Workers’ Section of the International Transport Workers' Federation. He is the author of The Rise and Fall of the Welfare State .